Lately, every time I look in the mirror or at a photograph, I first see my enlarged thyroid. No more face, just the multi-nodular goiter that is sticking out of my neck. Tests indicate that cancer might be present, so it will soon be coming out. Reading “The Dogs of Cancer: Dancing with Medullary Thyroid Cancer” by William Kenly was both informative and almost a little too real for me. At times, I caught myself reading with my eyes pointed on the words, yet my head turned away from the book as if I was watching a horror movie instead of reading a heartfelt story about one man’s journey in dealing with a rare thyroid cancer. William Kenly’s personal experience of being diagnosed with Medullary Thyroid Cancer is incredibly thought provoking because not only was he dealing with a part of his body failing him he was also having to handle incompetency in the medical community. Until he found the right physicians who knew how to treat this form of cancer, he had the nightmare of suffering through many unnecessary procedures. While this type of thyroid cancer isn’t the type that I would be most likely to have, if I have it, I definitely learned from his experience. There is a lot to be learned about Medullary Thyroid Cancer in this book, and I believe the people who have this rare form of cancer will be relieved to hear someone else’s story. I also believe that family members and medical professionals will also gain a great deal of information and more empathy when interacting with individuals who have this diagnosis. For myself, I learned a great deal more about the thyroid itself, and that I must be proactive in my treatment. My eyes were really opened. 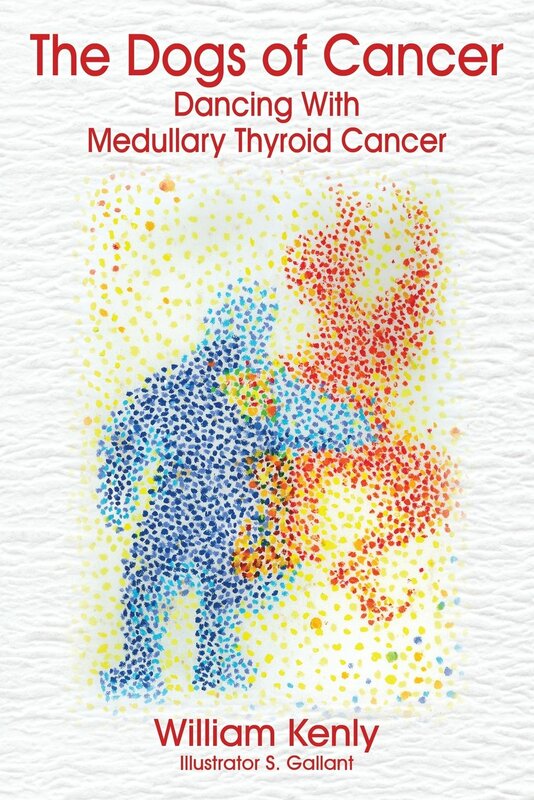 I highly recommend reading “The Dogs of Cancer: Dancing with Medullary Thyroid Cancer” by William Kenly. This entry was posted in Books, Health & Body, Medicine & Health Sciences / Psychology, Non-Fiction, Self-Help and tagged Book Review, The Dogs of Cancer: Dancing with Medullary Thyroid Cancer, William Kenly. Bookmark the permalink.